Kayaking is itself a great fun. When combined with fishing, the whole thing becomes an invaluable source of amusement. For a great holiday escape, kayak fishing is no less entertaining than any spectator sport. What if you’re just a learner full of enthusiasm? You won’t want to get deprived holding onto the time you become a pro. We have compiled a list of five kayaks designed for beginners as the manufacturers claim. Hopefully, you would find the best fishing kayak for your need from this list. Vibe Sea Ghost 130 is a popular sit-on-top kayak. 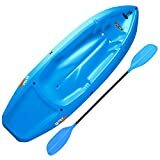 The kayak is a durable one and comes at an affordable price. Its free paddle, rudder, and comfortable seat have made it more user-friendly than most other kayaks. The polyethylene material has made this Vibe Sea Ghost 130 kayak durable and portable. You may find this kayak not very speedy but not too slow either. Moreover, the stability enables you to be sited or to stand on it. Besides these the Vibe Sea Ghost 130 kayak is very comfortable to use as it serves the purpose of fishing, recreation or any other water sports. Sometimes the pain comes quickly but there nothing much to worry about as color is not a big issue for using a kayak. 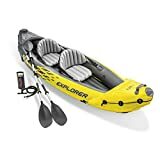 If the wider area with a lower price is what you are concerned about, then this kayak can be the best fishing kayak for you. Highly maneuverable and stable positioning are the biggest priorities for a serious angler, and Vibe Kayaks Skipjack 90 is a perfect combination of both of this features. Both the beginner and the experienced kayaker will be benefited with the small and convenient kayak. You can use it for recreation too. The kayak is durable for being constructed with the roto-molded single piece high-density polyethylene material. Moreover, its lighter weight has made its carrying easier. You may find the dimension small, but it is good enough for one person. Along with that, you can take all your fishing equipment in it. The two paddle prevents loss overboard, and stable grip makes the holding easy. If you want to have a noise free fishing experience, then Vibe Kayaks Skipjack 90 can be a good choice. 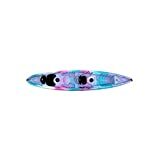 Lifetime Youth 6 Feet Wave Kayak came on sale as one of the complete fishing kayaks for kids. You will find all facilities that you want for your kids. It can hold kids of 5 years or more who weighs less than 130 pounds. Your kids can quickly enter the kayak after swimming. Ergonomic cockpit design makes it able to ensure proper balance and footrest gives a comfortable seating system for your kids. Its self-bailing scupper holes drain the water from the cockpit area easily. The kayak is durable for being constructed of UV-protected polyethylene material. Moreover, lightweight design helps your kids to carry their kayak. But, for a speedy kayak, you may not consider this kayak as your first choice. But we think a speedy movement is not that much important for your kids as it may cause some unwanted incidents. Sea Eagle SE370K_P Inflatable Kayak gives you better safety on both fresh and salt water, no matter whether the weather is calm or windy. This is an upgraded version of Sea Eagle 330 kayak. This Sea Eagle SE370K_P Inflatable Kayak is heavier than 330, so the capacity is also higher. Along with that it has been specially designed for the beginners. Balancing on the kayak is difficult for the beginners, but Sea Eagle SE370K_P Inflatable Kayak can enable you to maintain your balance on the water. Thought it had been designed for two persons, the kayak is capable enough to adjust three persons easily. No matter whether you move slow or fast, you will be safe with this kayak. The kayak is inflatable, durable and maneuverable, so you will face no noisy hassle to find fish with it. Additionally, the paddles will lessen your effort and will also allow you for smooth movement. But sometimes manually operated paddles can create tiredness if you keep moving for a long time, so you need to need paddle the kayak periodically. Sun Dolphin Bali 13.5-Foot Tandem Kayak can be the best fishing kayak for you if love to have trill. It is capable of carrying three people at a time, so it is ideal for your family too. You may find this type of large kayaks, but at this price, range finding will be hard. No matter if you are moving alone or with one or two partners for fishing, the kayak can give place to all your fellows. The size and thermoformed plastic construction material may enhance the weight, but it will remain portable. You can adjust your sitting position to have a comfortable fitting. Moreover, the high backrest and adjustable footrest will enhance your enjoyment more. It has been designed for professional anger with separate compartments and hatches for keeping their fishing tools together so that these can be available within the reach when needed. 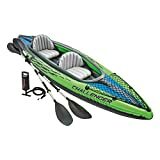 Any of the above choices can be the best fishing kayak for you depending on your intended uses and passion for the sport. These choices are especially designed for beginners, but some of the models can be ideal for professionals.